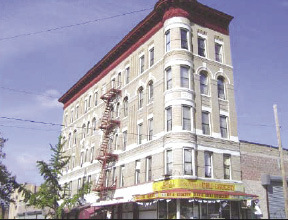 According to Josh Goldflam, managing principal of investment sales firm Highcap Group, the sale of the building located at 15 Gouverneur Place, AKA 1133 Washington Ave. in the Morrisania neighborhood sold for $850,000 all cash. Goldflam represented both the buyer and the seller of this property and handled the exclusive listing for Highcap Group. The corner Art Deco building was originally built in 1931 and is located at the intersection of Washington Ave. and Gouverneur Place. The five-story walk-up mixed-use structure consists of 8,120 gross s/f and has 10 apartments and one retail stores with 87 ft. of frontage on the block. The property was partially renovated with new gas boiler, hallways and some renovated units. The building is 100% occupied and presents upside potential for the new buyer by further renovating units and upgrading building mechanicals to achieve optimum rents. The buyer was able to take advantage of the assumable mortgage that came with the building that is due to expire in 2015. The property sold for $850,000 which represents a sales price of $70,833 per unit, a rent roll multiple of 6.3 and a Capitalization rate of 10.5%.